Andrew Tonkovich is a man about the town when it comes to reading, writing, teaching, talking and blogging about books and writing in the L.A. area. Mr. Bib as he’s known on his KPFK radio show, Bibliocracy, also teaches composition at UCI, edits the Santa Monica Review and writes the blog, OC Bookly, for the O.C. Weekly. Andrew’s recent publications include stories in Best American Nonrequired Reading 2013, and Ecotone. Andrew is the binding holding the UC-AFT Local at UCI together, serving as local president and grievance steward for many years. For more on Andrew’s work as the O.C.’s unofficial ambassador of the literary arts and on his pedagogy and activism, please read on for this month's UC-AFT Member Spotlight interview with Andrew Tonkovich. Insider: You've hosted a weekly radio show, Bibliocracy, on KPFK for many years. Every week you review a book and interview the author. It's quite a pace. What does this show mean to you, personally and as a writer? A.T.: My first show is in some ways still the most meaningful, or defining. I began hosting Bibliocracy on Pacifica station KPFK in January 2008 and my very first guest was former California poet laureate Al Young, who is also an activist, short story writer, essayist, novelist and blues/jazz man. I admire him tremendously for his life as an advocate and artist, and was so pleased that he agreed to appear. He sang on the show, and read poems, and his amazing performance sort of forced me to try to continue to meet the high bar he set. I always read the book by a writer I interview, and learn so much by way of trying to ask smart questions. It forces me to read and research. It also turns me into a proselytizer for good writing, and a sometimes annoyingly enthusiastic recommender of books. Insider: You're also editor of the Santa Monica Review, where you took the helm from your former teacher and founder of the Review, Jim Krusoe. Does your experience with that teacher-student legacy impact the way you engage your own students? 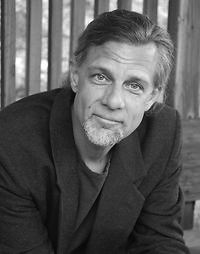 A.T.: Jim Krusoe, novelist and short story writer, is one of the best people any reader, student, writer could meet. Hundreds of sincere So Cal scribes will vouch for that, many of whom (like me) joined his workshop at Santa Monica College, where he insisted on sincere engagement with reading, and yet always found something encouraging to say in students’ original writing. He is a tastemaker and a mentor, and a generous teacher but without compromising on high expectations. People should read the novels by this wonderful writer of fabulist and allegorical work. To put it less poetically, I try to be like Jim, both as teacher and writer. Insider: How does your work on Bibliocracy and with SMR find its way into your classes at UCI? A.T.: I teach Composition to beginning undergrad writers, “Argument and Research,” but with a pretty unshy emphasis on learning civic literacy along with achieving basic writing skills and research acumen, including source evaluation and reading the daily newspaper, listening to community radio, engaging with the discourse of community generally. So that most of my teaching --- and learning from my students’ research! --- is all about staying hip to public policy. It’s not so much in the literary world, more in the area of holding one’s own with political discussion and proposed legislation and, yes, trying to affirm the practice of what Noam Chomsky calls “intellectual self-defense.” I do try to persuade students to learn about public policy and thoughtful discourse by listening to community radio. Radio is for me still the ideal medium. It’s perfect: smart and talented voices offering arguments, art and music, calls to action, analysis, all toward building democratic participation. All while you are washing the dishes, working in the garden, sitting at your computer or driving the car. We don’t have TV at my house. We are radio people. Words, more than images I guess. Insider: In the heart of O.C., you bravely steward a union local, serving as president and representing your colleagues in grievances and other matters. 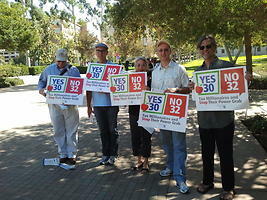 Considering your experiences in these positions, how do you value the presence of UC-AFT for non-senate faculty at UCI? Is it a political thing, a matter of ideology, or is it more pragmatic? A.T.: My own orientation/valuing involves all of the above, but I note that for many less overtly political types, the pragmatic and practical is what’s as important. Defending the MOU is our main job at UC Irvine, being there for people who need grievance help, and administering a terrific Professional Development Fund. I like to think that less reflexively or ideologically pro-solidarity members of our unit will see that and contribute in their own way. I have personally been a marching, demonstrating, singing kind of activist since I was a young guy, but I know that for a lot of folks that’s not an option. There is room for all kinds of participation, and I value contributions from people in all kinds of ways. We have an excellent campus rep, and the two of us trade off by way of devising ways to engage people. It’s nice, of course, to be wrong, and discover that a seemingly reserved person has a deep commitment to labor justice, especially, yes, in Orange County! Insider: You've volunteered to spend part of a day at UCLA talking to lecturers about the union and the important issues of the day. This kind of work is so important for our union. So, thank you! Tell us what motivates you to visit another campus to talk with your lecturer colleagues about UC-AFT? A.T.: Solidarity. I’ve been so very lucky to work with amazing Lecturers and Librarians who do a whole lot more than I do, so I’m happy to show up as needed. I’m so grateful to union leaders who’ve served on the board and on committees, spent hours and hours in bargaining, pursued grievances, and done the vital administrative work of our union. Not a big deal to visit another campus. Looking forward to meeting people and seeing old friends, comrades. Insider: You've done a lot of member outreach work at UCI over the years. Do you have any tips for people who support the union but might feel a little uncomfortable bringing up UC-AFT with their coworkers? A.T.: I am not shy and find discomfort easy to overcome with honesty and my own sometimes clumsy humor. I try to offer an example, if sometimes perhaps over the top, of engagement. But over the top is where the assault on public education, trade unionism, labor justice and democracy has been, since I was coming up in the odious Reagan years. So I am fine with just speaking the truth, as they say, not to power, but to people who need to be reminded that they have power and it’s a good thing to use! Insider: We know you lead a fantastic literary life, and that you are lucky enough to teach your craft…why don't you tell us something we don't know about you. A.T.: Hmm, I’m pretty much an open book, no kidding: reader, writer, editor, radio geek. For more about what goes on in the rest of what passes for life and in my mind, you might find characters in some ways resembling me in my own fiction, including recently anthologized work in Best American Nonrequired Reading 2013 or Ecotone. I have been ecstatically happily married to another writer-teacher-activist, Lisa Alvarez. My son is an actor whose performances in, yes, Orange County-area (!) productions of extremely smart and political plays, Sondheim’s “Assassins” and “Ragtime” --- from a novel his father adores! --- have made both parents so very proud and gratified. All of this lovely life of the mind and heart is usually accompanied by joyful songs of resistance and solidarity as sung by my favorite folk-punk band, Chumbawamba, played quite loud.